I like a good pun and these are mostly good. Sure, they’re not new, but they work, and the theme is consistent throughout. I had the most trouble with that central entry; some of those crosses were tough to suss out (TSU, SERGES). It was also tough to parse because it looks like the word “nowhere” wants to be in there. What really got me though were some of the very unusual words in the grid not helped by their own tough crossings: SUASION (80a, [Coaxing]) crossing the same TSU from above, ARPEL (37a , [Adrien of skin care fame]) crossing the ambiguously clued LOT [Studio section], and LESE (30a, [___-majeste (treason)]) crossing EARLAP [Winter hat feature] which I wanted to be EAR FLAP. SEC clued as an acronym crossing [Capital of Cyprus] NICOSIA might also have caused some people grief. But there are plenty of goodies to admire as well: OLYMPUS, TARRAGON, BLYTON, HAIR DYE, DEW POINT, STEPDADS, TINKER, EASY MARK, OSCAR NOD, ACCIDENT, POT SHOTS, NAIL FILE, and NOSELESS [Like Voldemort, in the Harry Potter films]. Plenty of fun to be had in those. Enough that I can look past stinkers like PAYS A and IRED. Oh, and I never thought I’d see 6d ATOR in a grid. That cheesy film, subtitled The Fighting Eagle, was included in last year’s series of Mystery Science Theater 3000. To quote them, “How much Keeffe is in this movie?” “Miles O’Keeffe.” Sadly though, the entry doesn’t get a Fighting Eagle clue but [Fabric finish?]. Some sticking points in the grid, but overall, a fine, punny puzzle. 3.6 stars. Given my divided attention, I didn’t notice while solving that this is a grid design I generally dislike, as these chunky 7s tend to be laden with dull, lifeless words. But hey! David actually pulled this off, lots of zippy stuff. Italian soccer club AC MILAN. Yiddish SCHMUCK. “OH, IT’S ON.” SAMBUCA, APPLE ID, SEA SALT, BEAR HUG, yoga CAT POSE,”LET’S NOT,” a mythical CHIMERA, tasty PINE NUT, Scrabbly NOXZEMA cream, THE ABCS, sweet MOSCATO or a COLD ONE. 15a. [Where the term “jazz” as applied to jazz music originated], CHICAGO. Probably I’ve read that in something written by lexicographer Ben Zimmer, but it still managed to surprise me. And no, I’ve never been to the Green Mill, but it’s walking distance. 29a. [“___ make history and not the other way around”: Harry Truman], MEN. Women, Harry. There are women who make history. It’s not just for boys. 33a. [Magnetic intensity unit named after a Danish physicist], OERSTED. I had most of the letters from crossings and gambled on OLMSTED, but no. I’m not up on my magnetic intensity units. 1d. [Some work at hair salons], ACCENTS. These are not the “some people who work at hair salons,” but rather, “some work that’s done at hair salons.” It’s possible that my purple would be considered accents rather than highlights. 4d. [Raiding grp. ], ICE. Too many families torn apart. 6d. [“Not ___!”], AGAIN. Cute, but it echoes LET’S NOT. See also: CAT POSE plus 24d. [Dog and cat food], KIBBLES. 13d. [Bud to chill with? ], COLD ONE. Make mine a Peroni rather than a Budweiser. 30d. [They may be raised (hmm …)], BROWS. Oddly playful “(hmm …)” in there. Another C.C. puzzle this Saturday. And another joyous solve. I believe this has a word count of 70, and I solved this in just over 7 minutes without too much rushing, but I still think these Saturday LAT puzzles are just a tad tougher than they used to be. I am hoping C.C. is at the ACPT this year so I can meet her finally! She is a solid constructor, and this one is another gem: 4.5 stars. 14A [Smart timepiece] APPLE WATCH – I might like one of these for running, but no, I am not spending $600 on a watch. Yes, I know some are cheaper, but I just cannot do it. My Garmin watch was only $230 or so, and it does everything I need and more. Maybe I am just old! 40A [Beethoven’s “Rage Over a Lost Penny,” e.g.] RONDO – I remember playing “Rondo Alla Turca” by Mozart when I had piano lessons. Yes, you know the melody. 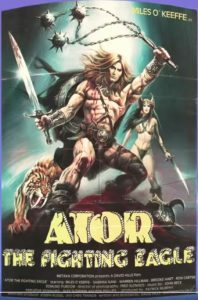 57A [Game whose heroine was played by Angelina Jolie in a 2001 film] TOMB RAIDER – And more recently played by Alicia Vikander in another movie I have not seen yet. 4D [County where the Golden State Warriors play home games] ALAMEDA – I knew the A’s and Raiders played at Oakland-Alameda County Stadium, which I believe it is now known by again. It had a few corporate names for a while. I have never been to Northern California, but I bet I would love it there. 11D [Cats with blond coats] WHITE LIONS – I thought this was a type of house cat at first! 12D & 30D [What an extended thumb might indicate] I NEED A RIDE & LIKE – Great double clue here! One evokes an image of a hitchhiker, the other the ubiquitous symbol from Facebook. Nicely done! 25D [Words of reinforcement] AND I MEANT IT! – Another great use of a casual phrase by C.C. 43D [Mo. named for an emperor] AUG. – I know this in part because I was born in August, which of course is named after Caesar Augustus. I could go on, because there is a lot to like! Today’s Lester Ruff puzzle was definitely “less rough” than normal. We have a break on Groundhog Day! I wonder if Stan will continue to use the pseudonyms he has, in light of recent changes of thinking in this area? I know one purpose is to give the illusion that the same person is not writing all of the puzzles, but perhaps if it is known that the same person is producing puzzles, submissions will start rolling in. I could be wrong. Also, What about the hybrid pseudonyms used by constructor pairs? Will those continue? So many questions. In the meantime, Stan has made a great puzzle here. And I am thankful it wasn’t so hard. 4.3 stars. 1A [US Women’s Open conductor] LPGA TOUR – The fact that there is a competition with this name in several sports, including tennis, makes this difficult. 36A [Unjustifiably] FOR NO GOOD REASON – Great long entry. Why does this convoke bad parenting for me? 51A [Power source for seven states] TVA – The Tennessee Valley Authority is crossword famous as part of FDR’s New Deal, if my memory serves me right. 62A [Unlikely to 55 Across] TACITURN – 55A is [Don’t go quietly] YELL, so the opposite works here. I usually don’t like hunting around the grid like this, but this one seems clever, even if for no good reason! 1D [NBA team formerly from Minneapolis] LAKERS – The Los Angeles Lakers started out as the Minneapolis Lakers, since Minnesota is the land of 10,000 lakes. The name stuck and is now deeply entrenched in California sports. 4D [He won his fourth term during Typhoon Lan (2017) ABE – I guessed at this one. Typhoons are in Asia, and the answer is three letters! 8D [No-nonsense on the job] RESULTS ORIENTED – Is this hyphenated? I neglected the “S” at first. A great long entry. 31D [Far from fulsome] MEASLY – Not a word you see often, so that made this tougher for me. Or maybe I am just not very bright! 36D [Spaces around a Trivial Pursuit board] FORTY-TWO – I believe you. 53D [From Dresden” surname] SACHS – Can someone explain this?? Have a wonderful weekend! We should be all thawed out by the end of it! This entry was posted in Daily Puzzles and tagged C.C. Burnikel, David Poole, David Steinberg, Lester Ruff, Stanley Newman, Zhouqin Burnikel. Bookmark the permalink. 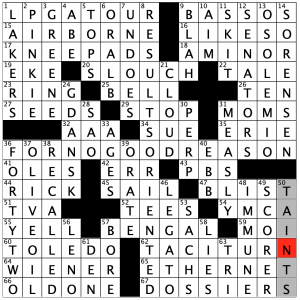 Second day in a row where the NYT contained a dupe of CAT in an answer and a clue: Friday’s puzzle had CAT CHOW at 33A and “Difficult thing to give a cat” at 1D. If dupes like these detract from your solve it doesn’t really matter, I guess, but these are not editorial oversights. 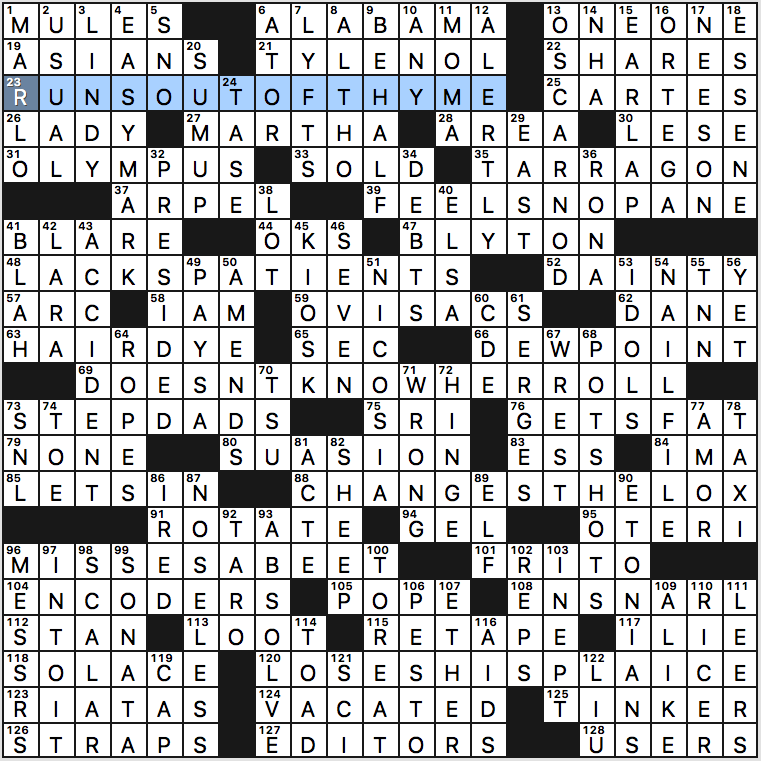 Will Shortz has said that he doesn’t find them to be flaws. Unless a clue so telegraphs the answer to an unrelated entry that it would spoil it for most solvers, WS sees no reason to restrain the clue. I even wrote a program that would flag such dupes pre-production, but Will didn’t see the point. 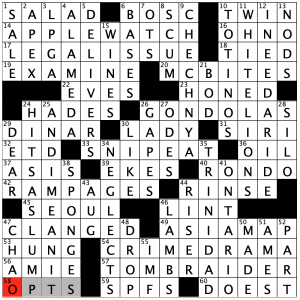 Other editors have a different view of dupes, but as far as the NYT crosswords go, these are features, not bugs. 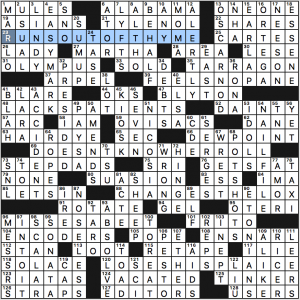 Anyhow, this was one of the hardest NYT puzzles I can recall in some time, but only in a good way. The challenge was largely in the clues, which is what I like. 4.5 stars from me. CAT POSE is a term that is indisputably correct, but one I have never heard in my yoga experience with at least five instructors. CHILD’S POSE, CORPSE POSE, MOUNTAIN POSE are three that almost always use POSE, but CAT POSE is usually referenced as something along the lines of “go through your CAT COWS.” The emphasis is always on the practitioner’s breathing, which is perhaps the single most important part of all yoga. Inhale COW; Exhale CAT. It is also great for the flexibility of your spine and as a stretching exercise. It was one of the few gimmes for me in what was a hard puzzle, especially the NE. Speaking as an undergrad physics major, OERSTED was a pretty deep cut. That was not a unit that I recall coming up very often. 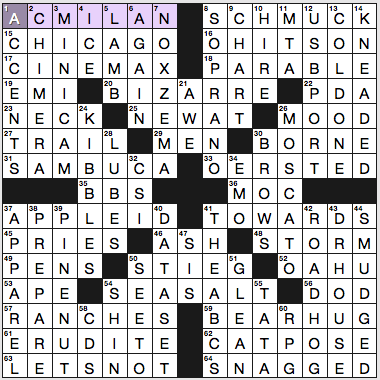 As a soccer fan I should be happy about AC MILAN as the opener in the NYT. But I wasn’t fond of the misdirect in the clue. We simply don’t call this “football” here. And in Italy it’s called “calcio,” which also isn’t a derivation of football. And nowhere but America would this be called a “franchise.” It just doesn’t add up as a clue. Pretty sure FIFA considers them a football club. Good enough for me. Hmm “good enough for FIFA” is not a hill I’d be particularly interested in dying on. PS. Good puzzles today, and thanks to all the bloggers for their write-ups! NYT: Hoo boy. That NW took about a quarter-inch off of my eraser. Despite starting with “Lech-“, 5D was not milk-related. 17A was not Netflix. It was not Miramax. Once I got AGAIN, things started to come together, but AC MILAN was not something I was able to parse until the very end (the M in MINICAM was my last entry, and I couldn’t make anything of AC_ILAN). It was all good misdirection, which I appreciate. The rest of it was smooth sailing – I do remember Hans Oersted from physics: he discovered that electric currents create magnetic fields – although I did have a little trouble with APPLE ID because I have an Android phone and I was a little slow getting KIBBLES. For me this was a tad easier than yesterday’s. I knew OERSTED off the bat, which helped, and with CM in place I hit on ACMILAN, and then most everything else was straightforward. Quite so. “It’s Now or Never” (1960). Preceded in 1949 by Tony Martin’s 1949 “There’s No Tomorrow”. 24a in the LAT, [Hot spot] HADES. Only if you consider the underworld of Greek mythology to be synonymous with a Christian idea of hell. I realize that some people use the two names interchangeably, but that seems quite far afield to me. I know you believe you are intelligent, but that you know more than dictionaries, which cannot be called- “some people” – is arrogant even for your standards. BTW, what part of the fill or the clue mentioned the Christian concept of hell? Hades is not a hot place. It’s only with the Christian overlay that it’s been synonymized so. And that’s probably because there was for a long time a weird proscription against saying the word ‘hell’. Another H-word made a good substitute, I guess. Some other religions may include the concept of a fiery afterlife, but do any of them sometimes call it Hades? The Times was quite a workout. I was led into the wilderness right from the beginning with 1A (“Football franchise since 1899”). I thought I was being clever by putting in “Packers,“ since I knew they were one of the oldest NFL franchises (actually, 1919). I think it’s legit cluing for a Saturday, but most folks in this country, at least, still that other game “soccer.” Overall, excellent puzzle. For what it’s worth, a schmuck is not a dummy; a schmuck is more of a foolish, gullible person. Hmm. I think of a shlemiel as foolish and gullible. A schmuck is a creep.